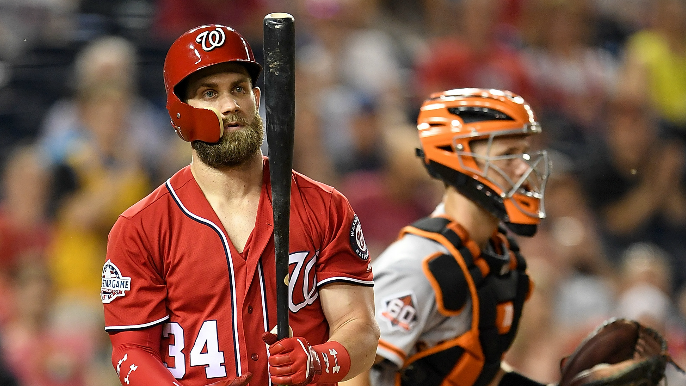 More details are trickling out regarding the Giants’ four-hour Las Vegas meeting with Bryce Harper that took place earlier this week. According to Alex Pavlovic of NBC Sports Bay Area, Harper talked about how much he likes Giants catcher Buster Posey during the meeting. The feeling appears to be mutual, as Posey publicly lobbied for the team to sign Harper when he spoke to reporters on Friday. “Sign him up,” Posey said. Additionally, the Giants were left “very impressed” by Harper after the meeting, according to Jon Heyman. There is an increased sense among some in the clubhouse that Harper would prefer to sign with the Giants according to Pavlovic. An offer was reportedly not made during the meeting, and it’s unclear if Harper would be willing to sign a short-term deal, as opposed to the 10-year contract he’s reportedly been pursuing. Giants new VP of Baseball Operations Farhan Zaidi has said that the club wants to sign at least two veteran outfielders before the start of the season. As it currently stands, the Giants will enter spring training with Chris Shaw, Steven Duggar, and Austin Slater as their projected starters.